Almost everyone who examines capitalism comes away with finger-and-thumb firmly pinching the nose. Taking a positive approach, Robert Reich exposes the faults but also recommends solutions in his superb “Saving Capitalism: For the Many, Not the Few” (ISBN: 9780385350570). It would be terrific if every elected official in America reads Robert Reich’s exquisite new book, “Saving Capitalism,” but that would be a tall order considering many Republicans lack reading skills and all of them have difficulty with comprehension. So it will fall to progressives, liberals, and independents to take the information in this treatise and place it in front of politicians — repeatedly and with insistence that they act. If the past is any indication, the message will have to be delivered hundreds of times and at top volume if anything positive is to be accomplished. There can be no “free market” without government. The “free market” does not exist in the wilds beyond the reach of civilization. Competition in the wild is a contest for survival in which the largest and strongest typically win. Civilization, by contrast, is defined by rules: rules create markets, and governments generate the rules. Those who claim to be on the side of freedom while ignoring the growing imbalance of economic and political power in American and other advanced economies are not in fact on the side of freedom. They are on the side of those with the power. And the powerful do not hesitate to exercise their clout at our expense. Wall Street, Big Pharma, the auto industry, Big Tobacco — all are fond of subsidies, tax loopholes, PR prevarication, and costly litigation. Reading a long litany of protections and special treatment for corporations and billionaires could become depressing except for Reich’s gentle tone and his implicit promise that things do not have to be this way. We — the people — have the power to bring lasting changes, and Reich shows some of the methods we should consider adopting as soon as we all decide to rid ourselves of the scourge of Conservatism. Reversing two disastrous Supreme Court decisions will be an excellent start. The five bought-and-paid-for corporate troglodytes on the SCOTUS gave us the horrific Citizens United v. Federal Election Commission (2010) and McCutcheon v. Federal Election Commission (2014) rulings. Failing impeachment of those anti-Americans, we need to elect majorities of sane people in the House and Senate so they can work with our next president (yes, I’m talking about Hillary) to enact progressive policies for a change. Some who are now typically on the right of the political spectrum — individual investors, family businesses, entrepreneurs, the inhabitants of rural communities, and the white working class, for example — may discover they have much in common with working women, minorities, and urban professionals, all typically on the left. Among other things, all are paying more for pharmaceuticals, broadband connections, food, credit card debt, and health insurance than they would be were the rules of the market not shaped by big corporations. I think we need to start blaming Conservatives for holding us back from being in the top ten for each of those categories. I’m tired of America being just a fair-to-middling country because RWNJs lie and cheat their way into positions of power. Let’s use this volume to fight back. There are facts, figures, charts, graphs, and a lot of clear, clean, concise language in the book. Even some Republicans will be able to understand many parts of it (although Conservatives will simply lie about it and make up crap as usual). In any case, the bottom line is this: we must change capitalism so that it adopts a form of democratic socialism or we will perish. 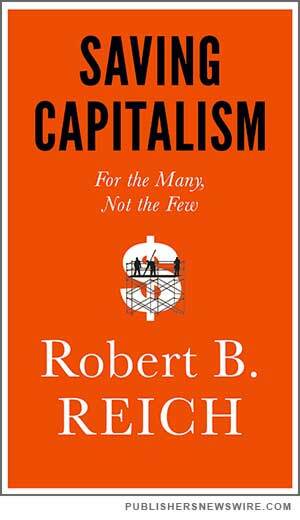 “Saving Capitalism: For the Many, Not the Few” by Robert B. Reich; Knopf (Random House), Hardcover, 304 pages, ISBN: 9780385350570, $26.95, 2015.